When Toyota launched the full-sized Tundra in 2006, they hired us to help connect this 381HP boat-towing beast to angler’s nationwide and we’ve remained absolutely humbled and grateful for the trust they’ve continued to place in us during the ten years since. From pro team management to event activation and the industry-leading Bonus Bucks contingency program, we execute a comprehensive program that delivers high visibility and engagement. When Toyota launched the full-sized Tundra in 2006, they hired us to help connect this 381HP boat-towing beast to angler’s nationwide and we’ve remained absolutely humbled and grateful for the trust they’ve continued to place in us during the ten years since. If you’re going to hire a partner to help with the extension of your legendary 127-year-old clothing brand to outdoor enthusiasts, you’d better work with people that know as much about standing on the front deck of a boat in a cold rain or a treestand on a blustery day during November’s whitetail rut, as they do marketing. If you’re going to hire a partner to help with the extension of your legendary 127-year-old clothing brand to outdoor enthusiasts, you’d better work with people that know as much about standing on the front deck of a boat in a cold rain, as they do marketing. LEER is the leading manufacturer of truck caps and tonneau covers, and when they realized thousands of tournament anglers rely on dry, lockable storage to carry expensive fishing equipment, they looked to Dynamic to help them launch the "Cover Cash" customer loyalty program. The program assures that their gear is safe and secure while giving them the chance to win serious incentive money at over 300 tournaments each year. LEER is the leading manufacturer of truck caps and tonneau covers, and when they realized thousands of tournament anglers rely on dry, lockable storage to carry expensive fishing equipment, they looked to Dynamic to help them launch the "Cover Cash" customer loyalty program. The New Laws of Performance. Our work with Bushnell has included national sweepstakes tours that we planned and executed on their behalf. The tours visited major retailers nationwide and included an online sweepstakes, data capture, and consumer product engagement – as well as product training sessions with store sales associates prior to each busy consumer-focused weekend of activities. Our work with Bushnell has included national sweepstakes tours that we planned and executed on their behalf. The tours visited major retailers nationwide and included an online sweepstakes, data capture, and consumer product engagement. Our presence at Gander Mountain locations working for Bushnell and Carhartt led to the nation’s largest retail network of outdoor specialty stores asking us to serve them directly. While our relationship continues to grow with Gander, they recently placed their trust in us to engage consumers on their behalf at two of the most prestigious events in the outdoor industry – Pheasant Fest and the Bassmaster Classic. Our presence at Gander Mountain locations working for Bushnell and Carhartt led to the nation’s largest retail network of outdoor specialty stores asking us to serve them directly. While our relationship continues to grow with Gander, they recently placed their trust in us to engage consumers on their behalf. The Reel That Taught America to Fish. Even people that don’t fish recognize the name ZEBCO. Their leadership sought our expertise to help them establish a stronger presence afield, especially for Quantum, their avid brand of rod and reels. The mission is to grant their iconic brands the earned media support they deserve through our focused daily PR efforts and field promotions. 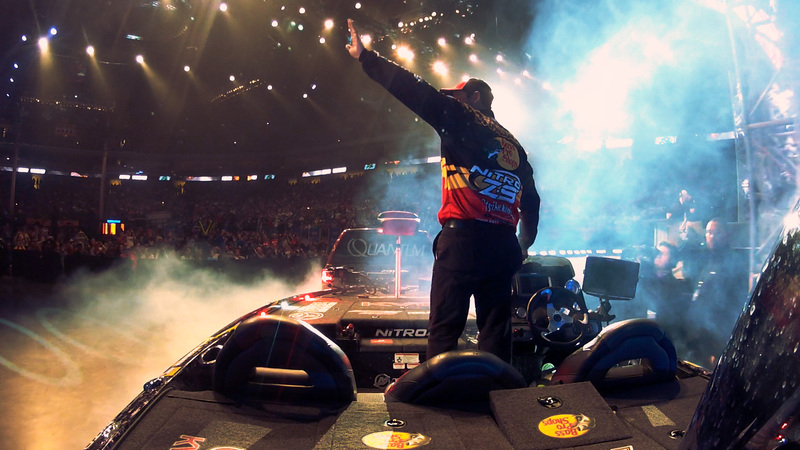 We deliver wins at numerous events per year ranging from youth fishing derbies to the Bassmaster Elite Series. Even people that don’t fish recognize the name ZEBCO. Their leadership sought our expertise to help them establish a stronger presence afield, especially for Quantum, their avid brand of rod and reels. The mission is to grant their iconic brands the earned media support they deserve. Lance P. Kendell C. Alan M. Jeff T. Jon J. We didn’t choose to make a living as marketers in hunting and fishing, they chose us – when you are defined by your passions, it’s only natural they define your work. We lean on decades of unparalleled experience in the outdoor industry to provide clients a level of daily service that is unrivaled with trusted leadership, efficiency and success. Whether it’s launching and registering thousands of anglers in a brand loyalty program, gathering social media content, turnkey execution of your presence at a consumer show, assembling a top-ranked pro angling team, or orchestrating a cover photo that includes your brand on a popular title – we’ve repeatedly proven our ability to make each of our clients a very impactful part of the outdoor industry. We lean on decades of unparalleled experience in the outdoor industry to provide clients a level of daily service that is unrivaled with trusted leadership, efficiency and success. Whether it’s launching and registering thousands of anglers in a brand loyalty program, or gathering social media content. We’re trusted to manage the most high-profile consumer engagement efforts and media outings in the outdoor business for two reasons – we know this space to our core and we get results. As an extension of some of the biggest brands in the world, we help reach avid outdoorsmen on their behalf – and in many cases, our clients aren’t even onsite. Providing branded vehicles, friendly faces, hospitality and meaningful content production opportunities for influential writers and editors, we provide turnkey execution in this space. We’re trusted to manage the most high-profile consumer engagement efforts and media outings in the outdoor business for two reasons – we know this space to our core and we get results. As an extension of some of the biggest brands in the world, we help reach avid outdoorsmen on their behalf – and in many cases, our clients aren’t even onsite. We help our clients gain the hearts and minds of 29 million anglers through weekly content generation efforts. When we’re not generating the stories and photos ourselves—we’re lending our longstanding media partners a hand in producing it. The result is year round in a highly credible, cost effective means of delivery. We help our clients gain the hearts and minds of 29 million anglers through weekly content generation efforts. When we’re not generating the stories and photos ourselves—we’re lending our longstanding media partners a hand in producing it. All the marketing in the world is worthless without tangible results. Nothing screams success like avid outdoorsmen purchasing client products as a direct result of a promotional effort we designed and executed. Our all-hands-on-deck effort has created a decade long history of concepting, launching and executing the most recognized incentive programs in the outdoor industry – including Toyota Trucks Bonus Bucks, Boat U.S. Weigh to Win and LEER’s Cover Cash. All the marketing in the world is worthless without tangible results. Nothing screams success like avid outdoorsmen purchasing client products as a direct result of a promotional effort we designed and executed. Celebrating the miles driven, the sunrises and sunsets, and the lifelong bonds we’ve made along the way. The folks at Dynamic live and breathe this stuff. That’s a rare commodity. If you’re serious about taking your company to the next level of brand activation with the foremost experts in the outdoor recreation markets, contact us.